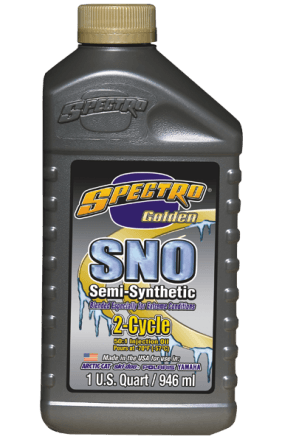 Formulated specifically for high performance two cycle snowmobile engines, Golden Spectro-Sno enhances pump-ability in all injector systems regardless of temperature. Golden Spectro-Sno virtually eliminates spark plug fouling, keeps piston ring grooves deposit free, reduces smoking significantly, and protects your engine in off-season storage. May be mixed at the Manufacturer’s recommended ratio. 50:1 is 13 ounces to 5 gallons.